Loropetalum chinensis is an evergreen shrub from China and the Himalayas of the broad leaf variety bearing fragrant flowers in the spring. Loropetalum has a spreading form and may attain a height of 12 ft in its native habitat with a width a bit more than half that. Common names for Loropetalum chinensis are Chinese fringe flower and Chinese witch hazel. The common name, "fringe-flower" and the Latin name, "Loropetalum" derive from the appearance of Loropetalum flower, the petals (petalon, in Greek) of which resemble fringe or little straps (loron, in Greek). Because Chinese Loropetalum is in the witch-hazel family those familiar with the flowers of witch-hazel tree will tend to notice the family resemblance. Pest free and hardy, the Fringe flower is a perfect Bonsai for a beginner and will delight its owner with abundant flowers that are beautiful and unique. 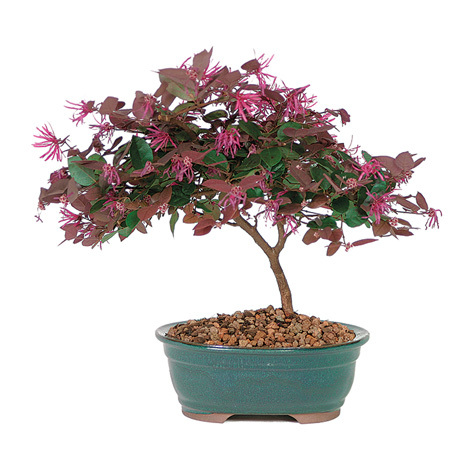 Chinese Fringe Flower matures into a Bonsai with maroon leaves, which sometimes turn reddish in the summer. It produces fragrant pink “fringy” flowers in early spring. The foliage is burgundy when the temperatures are mild and then turn mostly green during the warmth of summer. The versatility and heartiness of Loropetalum is that it can be grown outdoors in mild coastal climates in light shade to full sun, yet can tolerate the cooler winter temperatures and heat associated with other regions. A primary difference in the plants grown in these extremes is whether the plant remains evergreen or not. The Fringe Flower is colorful in full sun to partially shady locations inside or out. More shade develops foliage that tends to be less colorful with fewer flowers. Placing the Fringe Flower in bright diffused light will encourage brilliant blooms. The Fringe Flower has average water needs. Watering on a regular schedule without over watering will keep the plant moist and healthy. Be sure to provide a humidity tray to ensure that the roots do not sit in water where they will develop root rot, while still offering the moisture that this plant craves. The best time to fertilize is early spring, with an organic fish emulsion, but you'll likely discover that very little is required when it's grown in a compost-enriched soil. The Fringe flower bonsai tree is especially handsome pruned up from the bottom and shaped like a multi-trunk tree. You can prune it anytime, but it is ideal to do so just after the spring blooms fade. Wire gently into any desired form and ensure that the wires do not cut into the bark. Remove wires gently with cutters rather than risking breaking the branches trying to unravel the wires. This is a pest-free, exceptionally easy bonsai to grow that should give you very little trouble if not over or under watered and kept dust free to ensure proper “breathing” and cell development. To propagate it is best to take hardwood cuttings and dip in rooting hormone. Place cuttings in moist soil and wait for them to take root in a shady spot. Once they have taken root, you can transplant them into a suitable pot and wait for leaves to bud out. At this point, you can move your cuttings to an area with bright diffused light and expect to enjoy your new bonsai from the beginning.